851538 Agent Key Chain is a World City-themed key chain set released in 2005. It includes a key chain with an agent minifigure. The agent has a tuxedo, crew cut, and sunglasses and holds a walkie-talkie. 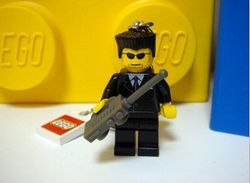 It features the Agent minifigure attached to a key chain. The minifigure parts can move, but can't come apart, because a special glue is used (see Key Chains page). Facts about "851538 Agent Key Chain"